Last week, the news spread through the whole of the United States, and I guess the rest of the world too. Harold Camping who runs an independent Christian Radio had predicted that Rapture would happen last Saturday across the world at 6PM local time in different places. 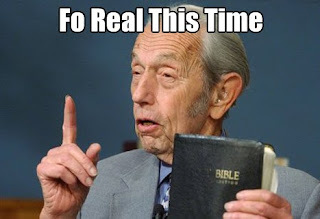 He said that after rapture on May 21, the world would experience a total meltdown on Oct 21. Anyway, he has now reversed his prediction to say that what happened on Saturday was a spiritual judgment and that the previous date for the Apocalypse is now the end of the world. Do you think the press should continue hyping this guy's predictions? Should people take him serious? And not just him but other prophets with a doomsday mentality. I wonder about his followers, some of whom sold, or gave away the last of their earthly belongings. How do they think now?